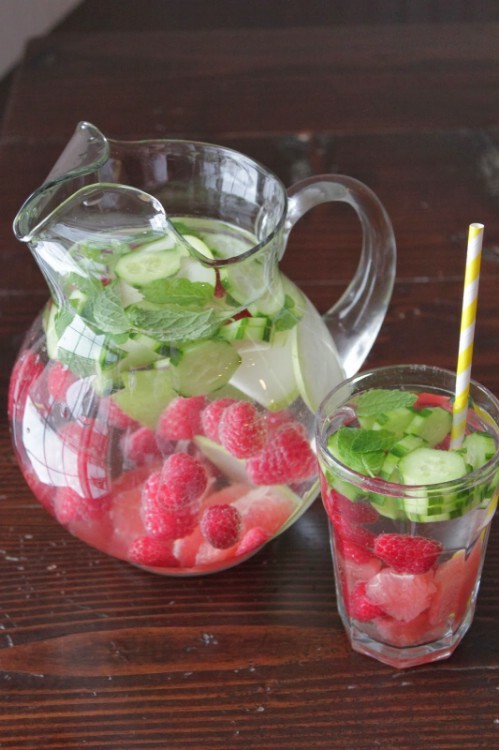 Try out these homemade detox water recipes for healthy, glowing skin! Drinking water is essential for a healthy body and a glowing complexion. But the fact of the matter is that when you are ‘prescribed’ to drink at least 10 liters of H2O a day, plain old water can get boring. Adding certain ingredients to your water not only gives it a refreshing and unique taste, but works to cleanse and detox your system. Some of these ingredients can be used to conjure up detox water recipes so you can get glowing skin as well! Your daily water regime is about to get a delicious upgrade. 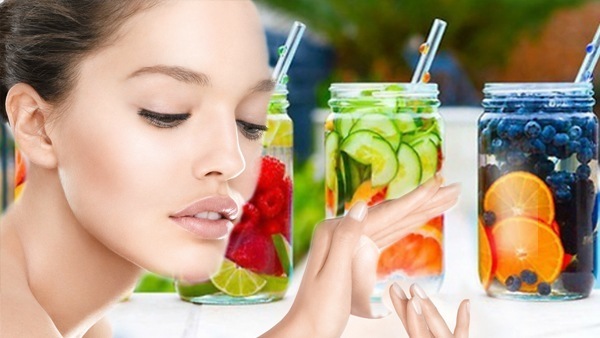 Here are 5 detox water for glowing skin and a flatter tummy! This is especially for those who are plagued by pollution-related acne and skin breakouts. 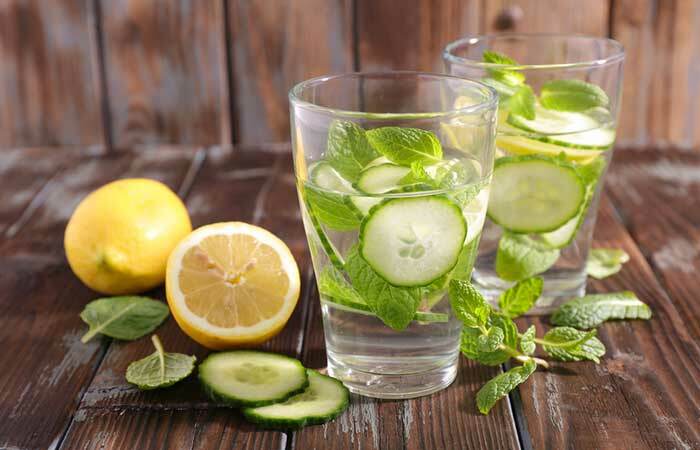 All you need to do is take 500 ml water and drop in thin slices of a cucumber and a lemon, along with 10-15 mint leaves. Refrigerate the detox water overnight. Drink this refreshing water the next day – it will not only clear your skin but also detoxify your body. 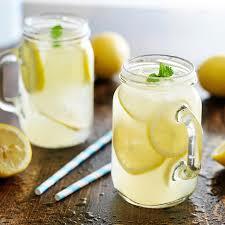 Lemon is known for its detoxifying and cleansing qualities that help remove waste from the body and promote cleaning. Cucumber is a highly diuretic ingredient which stimulates the removal of accumulated fluids in the body and also boosts hydration. 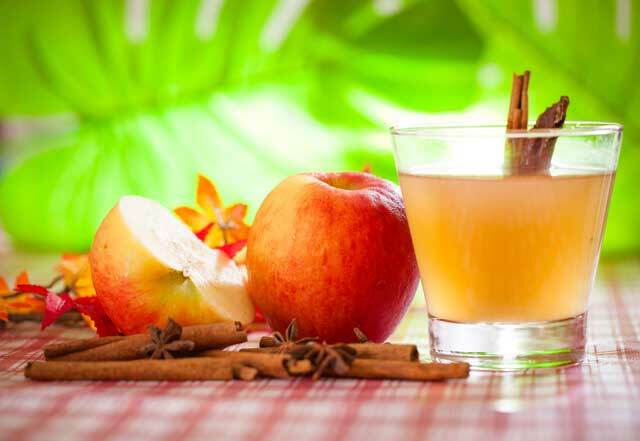 It also helps to improve digestion and promotes the elimination of waste from the body for better health. Mint in this recipe will help your digestion system. Mint is also rich in menthol and has anti-bacterial properties. You will benefit from all the health benefits of using mint as well as a refreshing taste. Chia seeds are a powerful super-food packed full of antioxidants and nutrients. They reduce inflammation and work to prevent breakouts, and mixed with oranges or sweet lime, provide a detox water you’ll love to drink day after day. 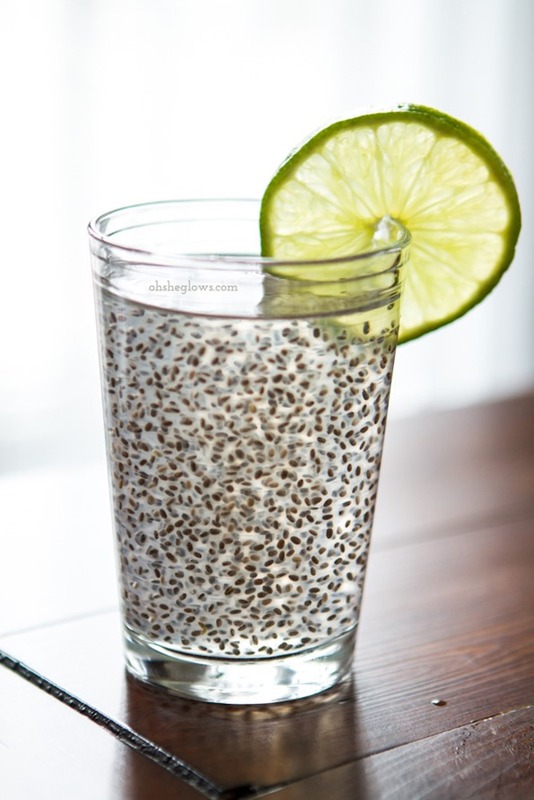 Soak a teaspoon or chia seeds overnight in a cup of water. Separately refrigerate 1 liter water into which thin slices of an orange or sweet lime have been added. In the morning, blend the chia seeds and mix into the citrus-infused water and you are done! Add a large bowl of cucumber slices, watermelon and kiwi to a liter of water. You could even add a smattering of berries like raspberry or strawberry. Next, use a spoon or a fork to gently mash the fruit down a little bit. This will let the juice out of the fruit to infuse your water. Refrigerate overnight for the best flavor. This detox water is especially good for battling acne. Take 2 liters of water and add the following: a cup of apple cider vinegar, two tablespoons of grated ginger, a handful of mint leaves, thin slices from two lemons (or limes or grapefruit) and a cucumber. Sprinkle two pinches of cinnamon powder and leave to infuse overnight. Citrus fruit helps detoxify the kidneys, and the lemon has antioxidant compounds called limonoids that activate detoxifying enzymes. Ginger is a digestive tonic that aids circulation and therefore makes the skin appear clearer. Peppermint – is a natural appetite suppressant and antimicrobial that eliminates germs in food and makes you feel fuller. Cucumber helps de-puff your body and is excellent for your skin. Take a liter of water and add a cup of apple cider vinegar, a tablespoon of aloe vera juice, one whole thinly sliced apple and a lemon, also thinly sliced. A tablespoon of honey could be added as a sweetener and also for its anti-bacterial properties. Let this infuse overnight. You could also toss in some herbs like mint or basil for digestion or inflammation support. Wow! I am going to take a print of this one, stick it in my kitchen and make a new concoction every day!